Out Now! 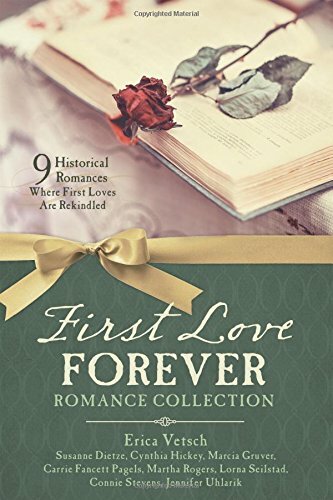 First Love Forever Romance Collection...and a Giveaway! 1877 – South Texas: Texas rancher’s daughter Georgie Bridge mourned when her first love, Ward Harper, left town to study the law, but now he’s back—as opposing counsel in a case against her father. 1880 – Ozark foothill ranch: Maggie Spoonmore marries her father’s former foreman, Zach Colton in order to salvage her reputation, yet struggles to believe he married her for love and not her inheritance. May of 1861 – Port Royal, Virginia: In Civil War Virginia, tables are turned for Willow Bates when Julian Finney, her childhood crush and steadfast defender, returns from the war a broken man in need of rescue. 1894 – Mackinac Island, Michigan: Robert Swaine, a ship captain, returns to Mackinac Island where his first love, Sadie Duvall struggles to support her siblings. Will she anchor him to the island he has vowed to leave behind? 1910 – Dallas, Texas: Chase Thornton, a wealthy oil man yearns for the life of a cowboy and his first love, Susannah King, but can she trust him to keep his word to leave the city and stay on the ranch? 1900 – St. Louis, Missouri: After Titus Knott crashes his hot air balloon behind Ella Mason’s boarding school, he must convince his former sweetheart that his words are true and not full of hot air. 1901 – Whitley, Kansas: Leah Brown accepts her role of town spinster until Gareth Shepherd unexpectedly steps back into her life. Now she’s faced with a choice. Can she forgive the man who jilted her? The authors are celebrating the book's release! There are oodles of prizes, more than pictured here. Just enter the easy-peasy Rafflecopter form! Thanks for helping us celebrate!